Monday, March 3rd, was our scheduled free day, where people could make up their own schedule of activities or just relax at the hotel. 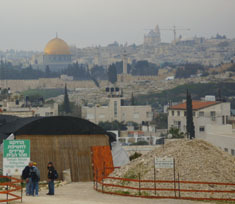 Almost everybody had someplace in Jerusalem that they wanted to go and see. Ten of us volunteered to participate in some actual hands-on archaeology, by volunteering at the Emek Tzurim sifting project. Nine from our group and one from Randall Smith's group traveled in three cabs to an area along the Kidron Valley just below the Hebrew University. We actually got out at the Mormon Center and hiked down the hillside to the site of the sifting. One of the crew members gave us a lecture on the background of the project and how the tons of dirt being sifted had been illegally removed from the Temple Mount in 1999 without proper archaeological supervision. Some exciting discoveries have been made since the sifting began, and although the dirt was improperly removed, at least it gives archaeologists the only opportunity they will probably ever have to study the Temple Mount archaeologically. Then the work began. She showed us how to dump a bucket of dirt onto a screen atop a frame, spray it down, spread out the contents, and search for interesting items. We spent about four hours at Emek Tzurim. Our most significant finds were a couple of coins, lots of mosaic tesserae, bones, Roman glass and (of course) pottery fragments. 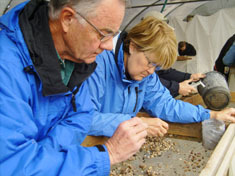 Several mentioned that this opportunity for hands on archaeology was one of the highlights of the tour for them. There weren't a lot of volunteers at work at Emek Tzurim at first but then some teenagers from a girl's school showed up and it got quite a bit livelier. Also, by divine appointment Jim and Jacquie Tanner struck up a conversation with one of the other volunteers and discovered that he was one of Campus Crusade's first staff people working in Israel. After we got back to the hotel we all went our various ways. I met up with Beth, John and Carol walking over to the Rockefeller Museum, which was just a few blocks from our hotel. Then I went to the Ecole Biblique for a scheduled interview with Father Jerome Murphy O'Connor for The Book & The Spade. After the interview Tom Powers and I grabbed a cab for a quick visit to Ramat Shlomo, where one of the quarries used to build the Temple Mount had been recently discovered. 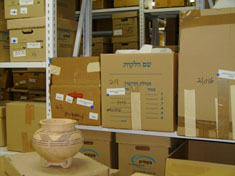 We also stopped in at the Israel Antiquities Offices for a short visit with archaeologist Sam Wolf, who gave us a short tour through the IAA warehouse at that location. After dinner in the evening we had one final meeting, after which everyone retired to their rooms to try and fit all of their purchases into their luggage.